1. a nucleoside composed of the pentose sugar d-ribose and adenine. It is a structural subunit of ribonucleic acid (RNA). 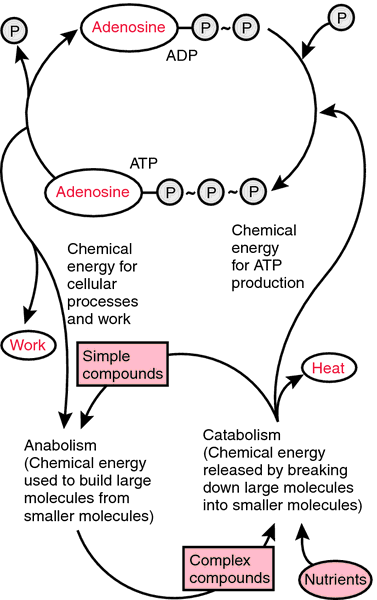 Adenosine nucleotides are involved in the energy metabolism of all cells. Adenosine can be linked to a chain of one, two, or three phosphate groups to form adenosine monophosphate (AMP), adenosine diphosphate (ADP), or adenosine triphosphate (ATP). The bond between the phosphate groups in ADP or the two bonds between phosphate groups in ATP are called high-energy bonds, because hydrolysis of a high-energy bond provides a large amount of free energy that can be used to drive other processes that would not otherwise occur. The energy that is derived from the breakdown of carbohydrates, fats, or proteins is used to synthesize ATP. The energy stored in ATP is then used directly or indirectly to drive all other cellular processes that require energy, of which there are four major types: (1) the transport of molecules and ions across cell membranes against concentration gradients, which maintains the internal environment of the cell and produces the membrane potential for the conduction of nerve impulses; (2) the contraction of muscle fibers and other fibers producing the motion of cells; (3) the synthesis of chemical compounds; (4) the synthesis of other high-energy compounds. 2. a preparation of adenosine, which acts as a cardiac depressant of automaticity in the sinus node and conduction in the atrioventricular node and as a vasodilator. It is used as an antiarrhythmic and is also used to cause coronary vasodilation during myocardial perfusion imaging in patients who cannot exercise adequately to perform an exercise stress test, administered intravenously. cyclic adenosine monophosphate a cyclic nucleotide, adenosine 3′,5′-cyclic monophosphate, involved in the action of many hormones, including catecholamines, ACTH, and vasopressin. The hormone binds to a specific receptor on the cell membrane of target cells. This activates an enzyme, adenylate cyclase, which produces cyclic AMP from ATP. Cyclic AMP acts as a second messenger activating other enzymes within the cell. Abbreviated 3′,5′-AMP, cAMP, and cyclic AMP. adenosine diphosphate (ADP) a nucleotide, adenosine 5′-pyrophosphate, produced by the hydrolysis of adenosine triphosphate (ATP). It is then converted back to ATP by the metabolic processes oxidative phosphorylation, glycolysis, and the tricarboxylic acid cycle. adenosine monophosphate (AMP) a nucleotide, adenosine 5′-phosphate, involved in energy metabolism and nucleotide synthesis. Called also adenylic acid. adenosine triphosphatase (ATPase) a term used to refer to the enzymatic activity of certain intercellular processes that split ATP to form ADP and inorganic phosphate, when the energy released is not used for the synthesis of chemical compounds. Examples are the splitting of ATP in muscle contraction and the transport of ions across cell membranes. adenosine triphosphate (ATP) a nucleotide, adenosine 5′-triphosphate, occurring in all cells, where it stores energy in the form of high-energy phosphate bonds. Free energy is supplied to drive metabolic reactions, to transport molecules against concentration gradients (active transport), and to produce mechanical motion (contraction of myofibrils and microtubules), when ATP is hydrolyzed to ADP and inorganic phosphate or to AMP and inorganic pyrophosphate. ATP is also used to produce high-energy phosphorylated intermediary metabolites, such as glucose 6-phosphate. An enzyme that catalyzes the release of the terminal phosphate group of adenosine 5'-triphosphate; visualized cytochemically in various cell membranes, mitochondria, and in the A band of striated muscle sarcomeres associated with myosin. an enzyme in skeletal muscle and other tissues that catalyzes the hydrolysis of adenosine triphosphate to adenosine diphosphate and inorganic phosphate. Among various enzymes in this group, mitochondrial ATPase is involved in obtaining energy for cellular metabolism, and myosin ATPase is involved in muscle contraction. An enzyme in muscle (myosin) and elsewhere that catalyzes the release of the terminal phosphate group of adenosine 5'-triphosphate. an ENZYME capable of catalysing the HYDROLYSIS of a PHOSPHATE bond in adenosine triphosphate (ATP). Usually adenosine diphosphate (ADP) and inorganic phosphate (Pi) are generated. The ENERGY released upon hydrolysis can be used for different purposes, such as to drive enzyme reactions, for the transport of IONS across MEMBRANES and to do mechanical work such as MUSCLE contraction. Many types of ATPase can also catalyse the synthesis of ATP from ADP and Pi, as in OXIDATIVE PHOSPHORYLATION. Such enzymes are often known as ATP synthetases. Enzyme that catalyzes release of the terminal phosphate group of adenosine 5'-triphosphate. one of the four bases that make up RNA and DNA containing the pentose sugar, 2-deoxy-d-ribose. Adenosine nucleotides are involved in the energy metabolism of all cells. Adenosine can be linked to a chain of one, two or three phosphate groups to form adenosine monophosphate (AMP), adenosine diphosphate (ADP) or adenosine triphosphate (ATP). The bond between the phosphate groups in ADP or the two bonds between the phosphate groups in ATP are called high-energy bonds because hydrolysis of a high-energy bond provides a large amount of free energy that can be used to drive other processes that would not otherwise occur spontaneously. The energy that is derived from the oxidation of carbohydrates, fats or proteins is used to synthesize ATP. The energy stored in ATP is then used directly or indirectly to drive all other cellular processes that require energy, of which there are four major types: (1) the transport of molecules and ions across cell membranes against concentration gradients, which maintains the internal environment of the cell and produces the membrane potential for the conduction of nerve impulses; (2) the contraction of muscle fibers and other fibers producing the motion of cells; (3) the synthesis of chemical compounds; (4) the synthesis of other high-energy compounds. a cyclic nucleotide, adenosine 3′,5′-cyclic monophosphate, involved in the action of many hormones, including catecholamines, ACTH and vasopressin. The hormone (first message) binds to a specific β-receptor on the cell membrane of target cells. This activates an enzyme, adenylate cyclase, which produces cyclic AMP from ATP. Cyclic AMP acts as a second messenger activating other enzymes via covalent modulation within the cell. key enzyme in degradation pathway of adenosine; catalyzes the deamination of adenosine to inosine. Many cases of severe combined immunodeficiency syndrome in humans result from a heritable lack of adenosine deaminase. a nucleotide, adenosine 5′-pyrophosphate, produced by the hydrolysis of adenosine triphosphate (ATP). It is then converted back to ATP by oxidative, substrate or photosynthic phosphorylation. See also adp. a nucleotide, adenosine 5′-phosphate, involved in energy metabolism and nucleotide synthesis. Called also adenylic acid. a term used to refer to the enzymatic activity of certain intercellular processes that split ATP to form ADP and inorganic phosphate, when the energy released is not used for the synthesis of chemical compounds. Examples are the splitting of ATP in muscle contraction in myosin head-groups and the transport of ions across cell membranes. Called also ATPase. used as a quantitative assay of the amount of avian leukosis virus in chicken tissues or tissue cultures. It depends on the virus's characteristic of carrying on its surface a phosphatase enzyme that dephosphorylates adenosine triphosphate. a nucleotide, adenosine 5′-triphosphate, occurring in all cells, where it stores energy in the form of high-energy phosphate bonds. Free energy of hydrolysis is supplied to drive metabolic reactions or to transport molecules against concentration gradients, when ATP is hydrolyzed to ADP and inorganic phosphate or to AMP and inorganic pyrophosphate. ATP is also used to produce high-energy phosphorylated intermediary metabolites, such as glucose-6-phosphate. The activity levels of adenosine triphosphatases in the RBC membrane were found to be low in cirrhotic patients. Because of potential interference of hawthorn with the polyclonal antibody-based serum digoxin immunoassay and competition between hawthorn and digoxin for possible binding to the same site of Na, K adenosine triphosphatase, thus interacting pharmacodynamically with digoxin, it is advisable that a patient receiving digoxin should not take hawthorn. We employed the lead (Pb) method for membrane- associated calcium adenosine triphosphatase (ATPase) detection. Routine light microscopic sections reviewed in each case included sections stained with hematoxylin-eosin, Gomori trichrome, esterase, adenosine triphosphatase (pH 4. Other stains, including adenosine triphosphatase at pH 4.